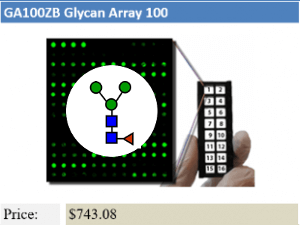 The 100 N-Glycan Array is used as a general test to help researchers determine binding characteristics of antibodies, proteins, bacteria, cell cultures, or other potential biological samples to an array of 100 fundamental N-glycans. 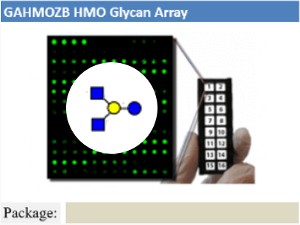 Our microarray slides are especially coated to be capable of immobilizing natural N-glycans with close-ring structure at their reducing end (GlcNAc). N-linked oligosaccharides in particular play a major role in intercellular interactions and immune cell functions, making them often preferred glycan candidates for the study of carbohydrate-binding-vaccines such as HIV Broadly Neutralizing Antibodies (bNAbs). The fundamental N-glycan structures provided in this array can provide understanding of basal binding determinants for antibodies or other proteins of interest. Example 1: A subarray assayed with glycan-binding protein biotinylated ConA lectin, followed by streptavidin-Cy3 conjugate. 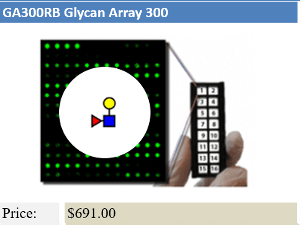 Array was scanned with a GenePix scanner at 475 PMT and 100% laser power at 532nm wavelength. There is no non-specific binding for the negative control spots. A positive control and the marker show binding as expected, as well as mannose-containing N-glycans. Example 2: A subarray assayed with glycan-binding protein biotinylated AAL lectin, followed by streptavidin-Cy3 conjugate. 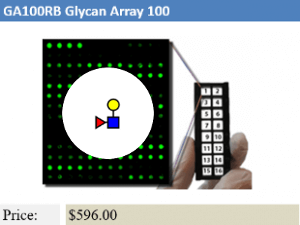 Array was scanned with a GenePix scanner at 475 PMT and 100% laser power at 532nm wavelength. There is no non-specific binding for the negative control spots. 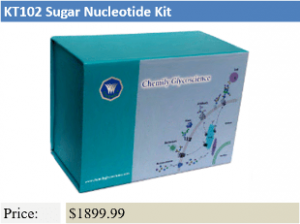 A positive control and the marker show binding as expected, as well as fucosylated N-glycans.